Afterwards, you will be redirected to the customer's dashboard. Here you can see all relevant information. 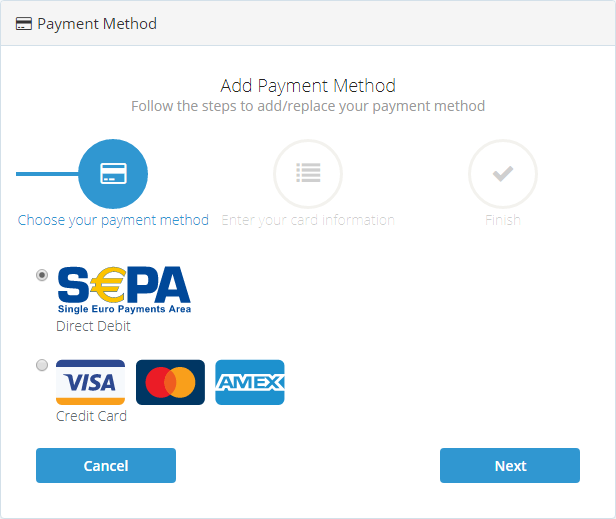 You can choose between SEPA direct debit or credit card. Then fill in the fields with the relevant information and finish the wizard. The payment method can be changed by you at any time and is automatically used for the next payment. You can find your invoices in the menu "Invoices". Here you can see a history of all invoices. You can also download them directly for your own use, as soon as a new invoice is created you will receive it automatically by e-mail. Should a change of your plan be carried out, you will see this in the folder "Subscription".